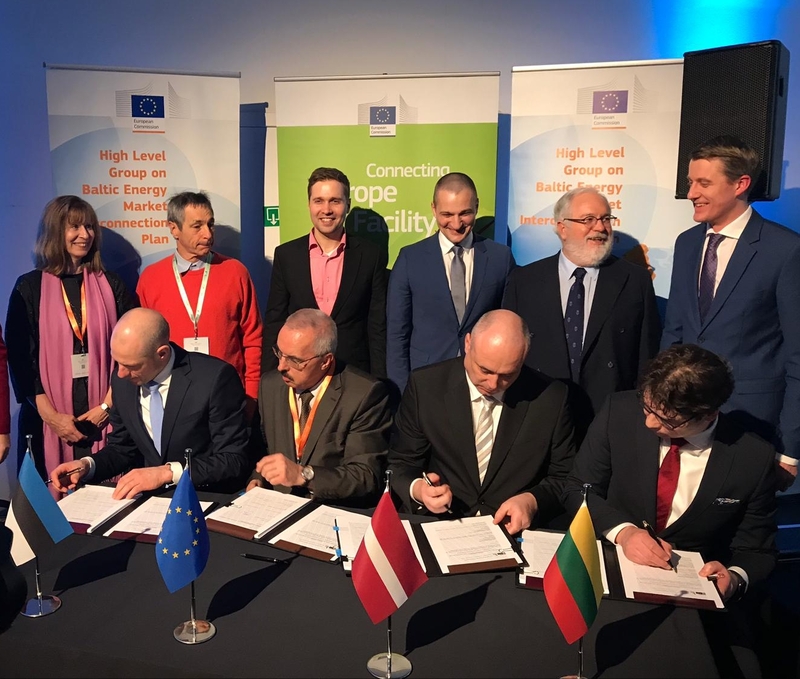 In the margins of the PCI Energy days on 19 March 2019 in Brussels, the Connecting Europe Facility (CEF) grant was signed to support the first phase of investments necessary for the synchronisation of the Baltic States' electricity network with the European system. Signed in the presence of Mr Arias Cañete, Commissioner for Climate action and energy, Mr Žygimantas Vaičiūnas, Minister for Energy of Lithuania, Mr Edijs Šaicāns, Director of Energy and Infrastructure of the Ministry of Economics of Latvia, Mr Jaanus Uiga, expert from the Ministry of Economic Affairs and Communications of Estonia, and Mr Dominique Ristori, Director-General for Energy of the European Commission, the grant, for works for a value of €323 million, will be used for reinforcements of the Baltic grid. Today marks another important milestone for the European Energy Union and in the Baltic States' ambition to truly integrate their electricity system with continental Europe, improve energy security in the Baltic region and reinforce European solidarity. The signing ceremony took place in the framework of the “PCI Energy Days” being held in Brussels on 19-20 March. PCIs, or Projects of Common Interest, are key cross border infrastructure projects that link the energy systems of EU countries. They help the EU achieve its energy and climate policy objectives for affordable, secure and sustainable energy for all Europeans and ultimately the full decarbonisation of our economy by allowing energy to flow freely from where it is produced to where it is needed, from one member state to the other. The synchronisation of the Baltic States' electricity grid with the continental European network (CEN) is an essential political priority for the achievement of the Energy Union. The relevant grid reinforcements have been included in the third EU list of Projects of Common Interest (PCIs). PCIs are intended to help the EU achieve its energy policy and climate objectives: affordable, secure and sustainable energy for all citizens. Projects on the PCI list are also eligible to receive Connecting Europe Facility-Energy funding.